E-Women 125 Years of UTO: What does this mean? The 9/9/13 screen shot shows the United Thank Offering board listed under CCAB (Committees, Commissions, Agencies, and Boards) instead as a board autonomous and interdependent, reporting to Executive Council. CCABs do not participate in the production of resources or in the carrying out of policy. Types of CCABs, along with the source and scope of their authority. · Appointment of new members at the beginning of the triennium. Convenor named to organize the first meeting and conduct an election of Chair, Vice Chair, and Secretary. Each officer has specific duties. · Expectation of members. Members must attend all meetings; unexcused absence from two meetings can result in members removal [Canon I.1.2(b)]. Consultants can only be hired under special circumstances. Chair’s duty to prepare an agenda for each meeting. Agenda will be circulated to the members and to the General Convention Office for posting. Chair and Secretary responsible for maintaining records and meeting minutes in collaboration with the Archives. Documents need to be preserved, including minutes, correspondence, E-mails, substantive drafts, and information disseminated at or between meetings. CCABs will file a triennial report which include General Convention resolutions. Reports will be compiled into a document commonly known as the Blue Book, which is produced before each General Convention. Blue Book reports must be submitted on time and prepared according to specific guidelines. No UTO president or finance officer? Vacant board members positions will be filled how? Does this mean the UTO “board” will no longer participate in developing the design of the Blue Boxes, Face-to-Face training, or Granting Criteria and granting procedure? The past-President is listed as “Chair” instead of “President”. Under CCAB there are no Presidents only Chairs. So does that mean that past-President & UTO board is already identified as being under CCAB’s of General Convention instead of Executive Council? The Executive Council member is listed as a member. The United Thank Offering by-laws identify the Executive Council member as a member of the board (as recommended in INC-055). The official notice received from the General Convention Office identified the member as a liaison. Clarification is needed and has not been completed. So what is the role of the liaison and the Executive Council as they relate to the UTO board? Is it still and will UTO continue to be a board? The four members resigned are removed from the list. The UTO President’s office listed as “chair” in the 9/09/13 screen shot is now listed as a “Convener”. So does this mean the Vice President that would be the President, per current by laws, of UTO upon the resignation of the past-President really isn’t President or even “Chair”; but instead already just a “Convener”? Is the UTO already considered as part of General Convention? Does this mean this change is already in place as proposed by the DFMS by laws regardless of the INC-055 and the Executive Council’s approval? What does this mean to the United thank Offering’s ministry of thankfulness? 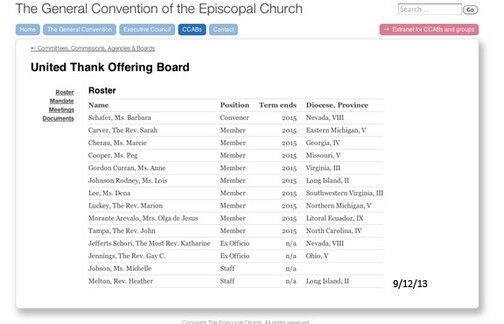 1) Is the United Thank Offering Board a Board created by General Convention as defined by the requirements of the Constitution and Canons of the Episcopal Church? 2) What process is used for this kind of decision? 3) Has this process been one in which the United Thank Offering governing board has participated?? Get ready to see the Thank Offering disappear into the legal fund. The more information we get, the worse it gets. Please know that you all are in my daily prayers. Apparently someone has already made some significant decisions. The management style behind this situation could provide a fascinating case study for Harvard Business School. This is the Office of General Convention and overseen by the Secretary of General Convention - Michael Barlowe. Looks like he has decided for UTO where it belongs and who are the officers. So much for reconciliation and the PBs promise "The Domestic and Foreign Missionary Society (DFMS), and its elected and official leadership (the President of the House of Deputies, the Chief Operating Officer, the Executive Officer of General Convention, the Treasurer, and I) have no intention of divesting the United Thank Offering of its funds or applying excessive controls to its practices." This is a sad read. What happened to letting mission speak for the church in place of squabbling? The stated goals and values keep changing. We have way more chaos and dysfunction with this new "hierarchy" malarkey than we did under messy old "unity in diversity. ".